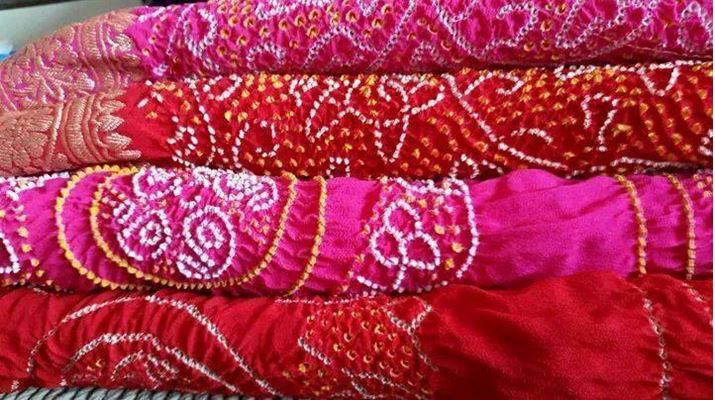 In India the legends in the world of textiles has many luminaries and most of them have acquired this haloed space because of not just the intricate weaves but also the manner in which color was added to the textile. 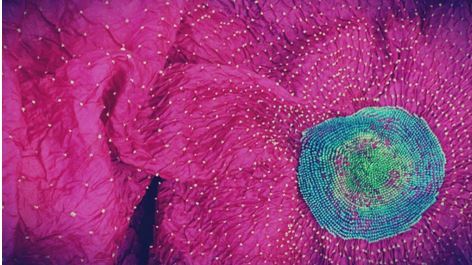 If you ever look at something that reminds you of the white specks of the milky way, glowing against the backdrop of indigo, deep mauve, saffron or charcoal gray, you would know that those specks are nothing but bandhej- the finest in hand dyed fabrics , mainly made in the states of Gujarat and Rajasthan. The first ever mention of any form of tie and dye fabric in India dates back to the times of Alexander. In fact, in the Harshacharita by Banabhatta, there is the mention of a bride who wears a tie and dye fabric. 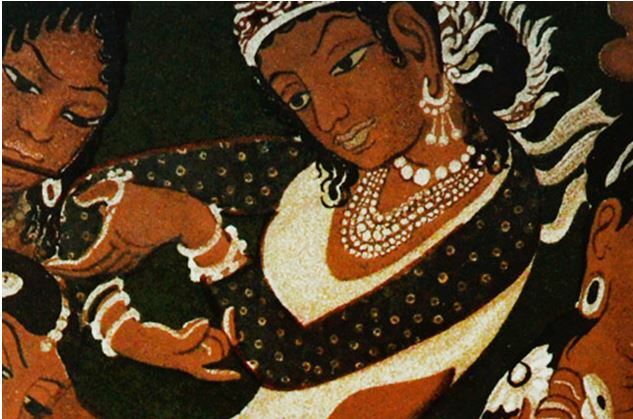 If one were to look at the walls of the Ajanta caves, amidst the golden and amber hues of the paintings, there is a clear depiction of the tie and dye pattern on some of the cloth draping the figures. A glorious past that simply exults with its beauty, having survived centuries of cultural flux, the tie and dye technique indeed is one of the finest dyeing traditions of India. The creases on the fabric speak a thousand words. Each of the creases, a reminder that the fabric was tied at that very same point, and then put into large containers that colored them in different hues. The areas in Gujarat that prominently practice this art are Mundra, Mandavi, Kachchh, Anjar, Khavda, Tera, and Bhuj. The technique involved is rather painstaking-about 4000 knots have to be tied on the cloth to cover an area of about two meters which means that a saree that has a bandhej pattern needs close to 8000 to more depending on the intricacy of the motif or pattern that needs to be worked on it. 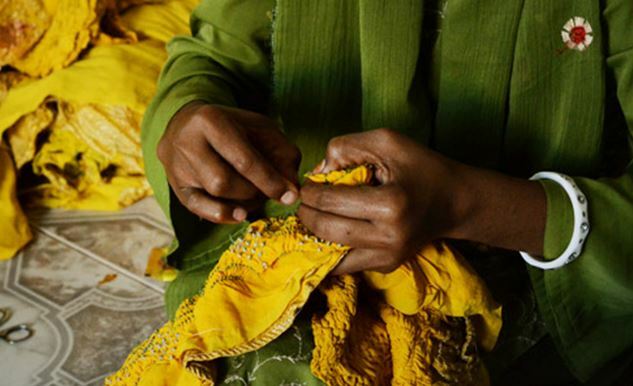 The job of tying with thin threads mostly collected from industrial waste is done by the women in the household, while the men in the community, are actively involved in the dyeing process. The process of dyeing in itself might take up to eight hours as the fabric would be dyed in the lightest shade first followed by the unraveling of some knots and the another dye and so on. The drying of the fabric would depend on the fabric and time of year- and status of sunlight. Gujarati sarees today have the reputation of being one of the finest handcrafted sarees one can find in India and the very fact that apart from some new dyes that have allowed faster and stronger colors called in the local language as ‘lipai’ that are more chemical based, the entire process of tying itself has remained more than 5000 years old-a tradition one needs to cherish and appreciate. In fact even today it is believed that a bride that leaves her home in bandhej will keep the tie of marriage alive forever. In fact a red colored bandhej would indicate a recently married girl while yellow would denote a lady who has just become a mother. Even the designs have been given common names so that one can identify the motif that has been depicted-the beldaar-is the vine or trellis shaped design, while ekdali is a simple dot, and boond is a dot with a dark center; satbandi is seven knots in formation and tikunthi is circles or squares that appear in threes. 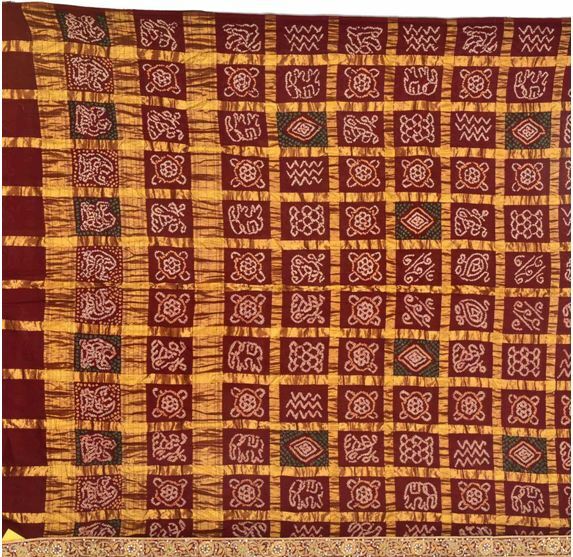 The Gharchola perhaps would be the finest tie and dye form that Gujarat produces. 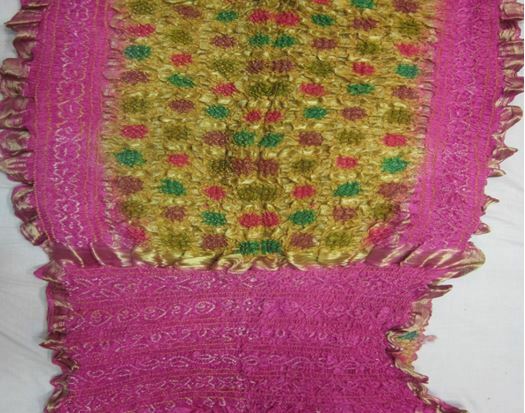 This fine form of weaving golden threads into the fabric to be used for tie and dye is called originally as Gharcholu, though originally the fabric used for that was cotton. But more and more of demand for the local silk called as gajji has made that quite a staple with the gharcholas. Gharcholas in Gujarat was used earlier just to make an odhani that was draped on the bride’s head right through the ceremony. The importance of it being that this was the first ever gift that the bride received from her would be husband and thus was considered auspicious. 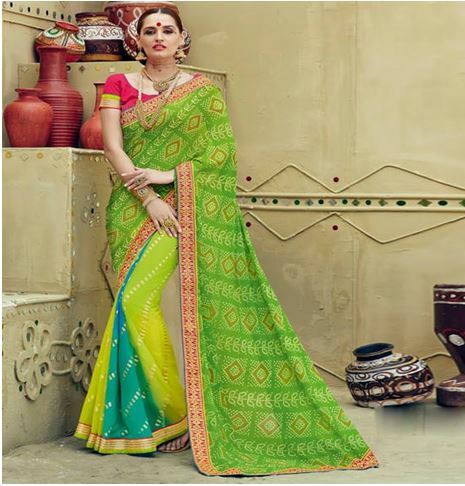 Subsequently, there were efforts to make it into a saree, and today it is considered one of the most important sarees any newlywed possesses in her trousseau. They come in gorgeous colors of which the most auspicious is orange and red, while green too has entered this bastion of gold and red. 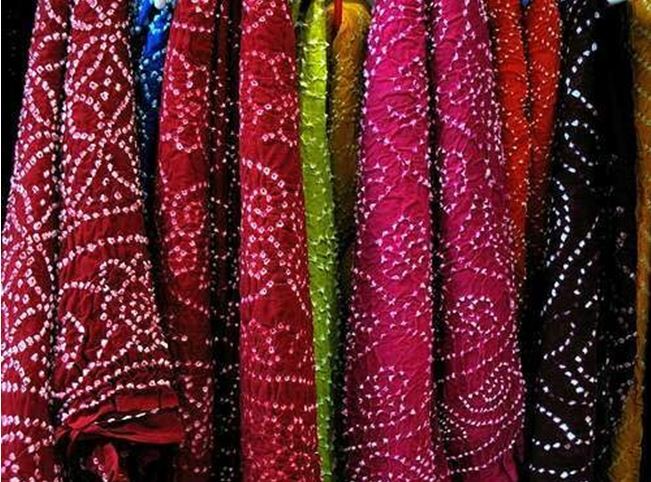 Famous for its experimentation with colors, the Khatri community manages the maximum trade and crafted of bandhej in Bhuj district of Gujarat. They have slowly begun breaking away from traditional color sources and typical color choices as well. Here is another popular style of making of bandhej-the pattern is called Laddu jalebi as you can clearly see in the whorls here that they remind one of the sweetmeat-a colorful metaphor that titillates the palette. Another common pattern worked in to the auspicious clothing is the Ambadaal or the mango branch-which has the entire pattern of jaal like design all over. 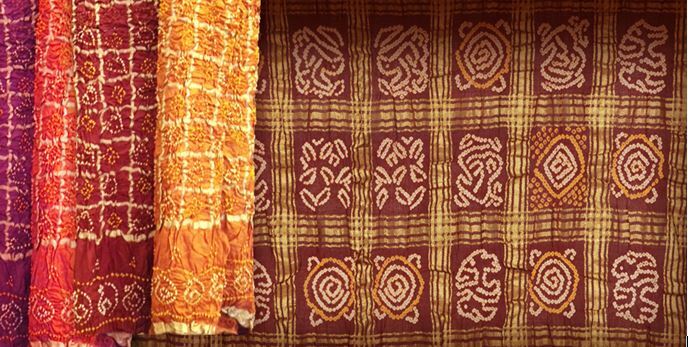 The Bavanbagh and the Rasamandalas are also patterns that have contrasting designs with borders in another colour. Bavanbagh actually means 52 gardens trying to denote the richness in the trellis pattern, while Rasamandalas is the circular dance pattern sin the Rasaleela of Krishna and the gopikas. Another term is the Chandrokhani where the analogy of the moon’s beauty compared to that of the bride’s. 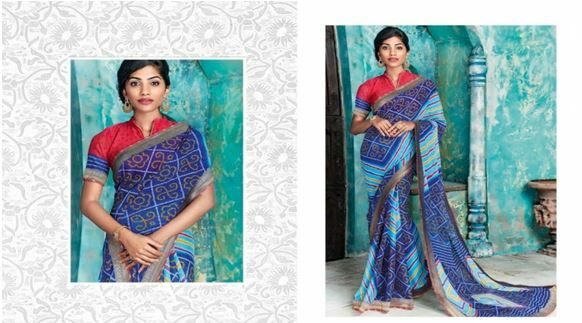 The very nature of bandhej pattern also denotes the love and nurture of tradition which makes its presence so solid in Indian textile history. 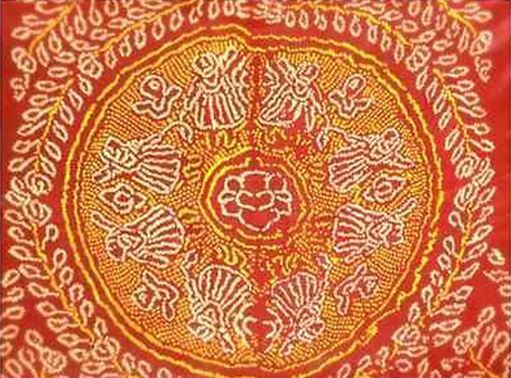 In the fabric above you can see the intricate patterns of the Rasamandalas or the gopis dancing, done entirely with the tie and dye method. Usually this pattern is used in the aanchal of the saree. 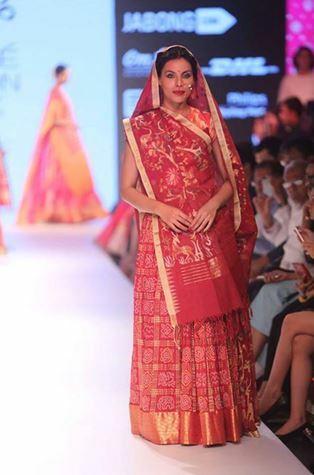 Making the ramp come alive with a new distinct energy has been this riot of colors brought by Gujarati bandhej. Here is one for the brides in the gorgeous gharchola worn with a seedha pallu. The tie of love that we feel for our traditions has brought the dyeing style to the forefront of fashion with experiments on jute and chiffons as well as georgettes, and there can be nothing more exciting than seeing the colors of the kaleidoscope making its way into newer fabrics.